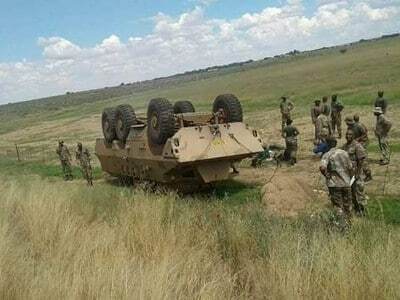 A Ratel ZT3 from 1 Special Service Battalion (SSB) rolled after the driver apparently lost control on the N1 between Bloemfontein and Edenburg on Wednesday with one fatality reported. The vehicle was part of a convoy heading to Cape Town for this year’s Armed Forces Day. The convoy, according to the SA National Defence Force (SANDF) directorate: corporate communication, left Tempe military base in the Free State capital early on Wednesday. A statement has it that military healthcare practitioners who were in the convoy stabilised all five soldiers crewing the infantry fighting vehicle. “The injured were stabilised at the scene and then evacuated to 3 Military Hospital in Bloemfontein. Unfortunately, one of the crew succumbed to his injuries and died,” the statement said, adding the name of the dead soldier would be released once his next of kin were informed. The remaining four crew members are in a stable condition. Armed Forces Day will be marked in Cape Town as the highlight of what has become Armed Forces Week on February 21 commemorating the sinking of the SS Mendi in the English Channel 102 years ago. More than 8 500 troops and hundreds of vehicles and aircraft from all four SANDF services will be in the Western Cape provincial capital for the week-long event which starts on February 15. Armed Forces Day has been held in Atteridgeville, Pretoria (2013), Bloemfontein (2014), Potchefstroom (2015), Port Elizabeth (2016), Durban (2017) and Kimberley last year.